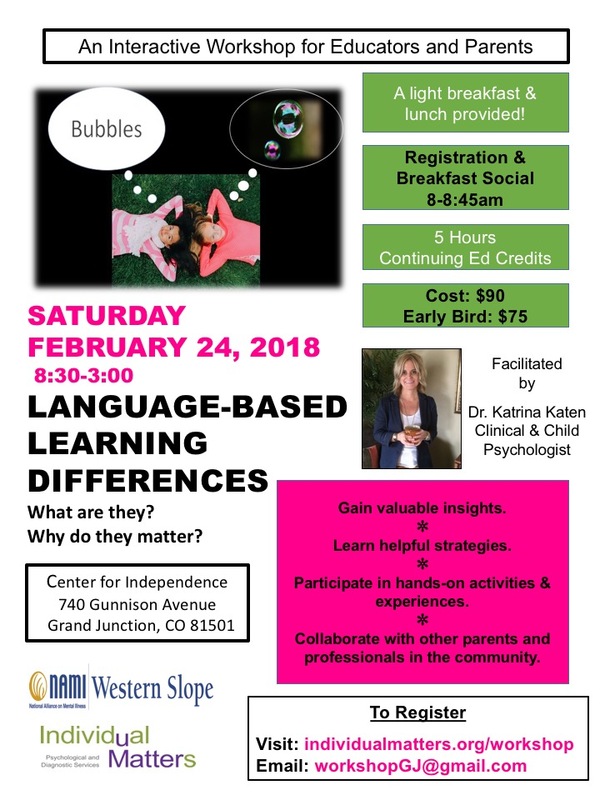 **Please note: The February workshop (Language-based Learning Differences) has been re-scheduled due to low enrollment. Please check back later for new date and times. We are partnering with NAMI, STRiVE, and other local service providers to deliver a series of interactive workshops right here in our own backyard! Our goal is to support the educators, providers, and parents here in Mesa County and Western Colorado, by bringing quality trainings to them. This will be a 3-Part Series, with each workshop integrating experts from our own community and beyond. Registration is now CLOSED for Part 1: “Language-based Learning Differences: What are they? Why do they matter?” This is ideal for educators, parents, and providers who work with students of all ages. Part 2 focuses on Autism Spectrum Disorder (ASD). For this workshop we will be partnering with STRiVE and the Audyssey Neurodevelopmental Diagnostic Team. All proceeds will go to the Audyssey Team so they may better serve Mesa County and surrounding areas. Early diagnosis is essential because early intervention is key! Feel free to email us directly at workshopGJ@gmail.com if you have a topic you would like to suggest, you would like to sponsor, facilitate, host, or offer a workshop, or if you have any other questions or comments. We would love to hear from you! Language-Based Learning Difference Workshop has been changed to a later date. Check back for details. Watch the Workshop Trailer to Learn More! The workshop is designed for both educators and parents of students ages all ages. There is an optional and informal “breakfast social” from 8am-8:45 (not included in the 5 hour CE credits). Registration begins at 8am and ends at 8:55am. No need to bring anything…journals for notes and handouts will be provided. Can I cancel my registration for a refund? Your registration can be cancelled up to 7 days prior to the event. Will my professional licensing board accept the continuing education credits? A certificate of attendance will be provided to all participants. However, It is the responsibility of each individual to check with their licensing board to ensure they will count the workshop for credit. What if I want to pay with a check…can I register by mail?